No one could accuse Rowan Coleman of shying away from difficult subjects in her novels. Her last book, Dearest Rose, tackled domestic abuse, and her new one, The Memory Book, features a mother in her early 40s who develops early onset Alzheimer’s. Dementia is usually associated with the elderly but in the UK there are more than 17,000 people with dementia under the age of 65 – a third of them with Alzheimer’s. 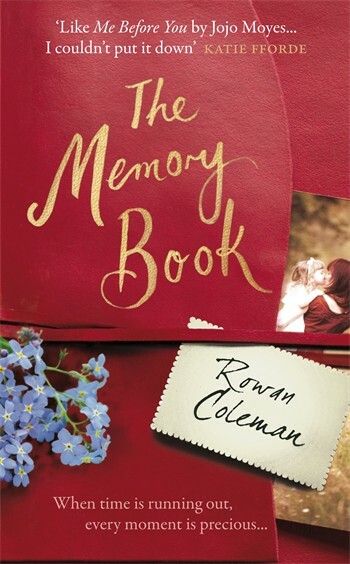 It’s undoubtedly a tough subject to tackle in a novel but Rowan Coleman does it with such warmth, sensitivity and emotional depth that it works. The Memory Book is the story of Claire Armstrong, a larger-than-life redhead who has combined a successful teaching career with caring for her two children. She had Caitlin, her feisty elder daughter, in her late teens and brought her up as a single mother. More recently she’s met and married Greg, a devastatingly good-looking builder ten years younger than her, and Esther is their three-year-old daughter. Claire’s diagnosis is all the more devastating because Esther is so little – Coleman’s description of Esther asking her mum to read to her and Claire not being able to decipher the words is heartbreaking. And then there’s Greg, a lovely man who patiently tries to support Claire but whom she increasingly sees as a stranger and pushes away. It’s Greg’s idea to buy her a “memory book,” a red leather-bound notebook for her to write her memories in, and the whole family – Claire, Greg, Claire’s mother, Caitlin – take it in turns to record their thoughts. My mother-in-law has Alzheimer’s and when I started reading The Memory Book I feared that it would be too painful to read. But in fact the opposite is true. It’s sad, yes, (you’ll definitely need a box of tissues at the ready), but it’s ultimately uplifting too. It doesn’t avoid the reality of this horrible illness but in the end it’s about the strength of the human spirit and the power of love. Hope you enjoy it, Carlie. And keep the tissues at the ready. It’s a tearjerker!